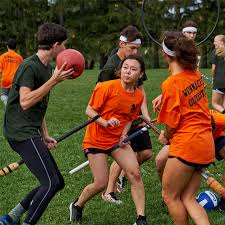 Middlebury College, home of Muggle Quidditch, is continuing its tradition of magic with this year’s Middlebury Classic Quidditch Festival. Over a dozen teams from around New England will battle on the pitch in this goofy sport. Last year, over 700 people took part in the festival, enjoying potion demonstrations, quidditch workshops, food trucks, acrobatics, face painting and visiting bands. All are invited to participate in activities and watch performances throughout the day at this family-friendly festival. The Middlebury Quidditch team proudly hosts the festival, but creating such a magical day is a community effort. Information and interest forms for teams, vendors, non-profits, and volunteers are available online at: www.go.middlebury.edu/quidditch. For more info, check out the Facebook event. Also: Starting now, keep your eyes out downtown for five snitches hidden in local businesses in the “Snitch Hunt” leading up to the event!